Styrofoam Insulated Panels or SIP homes are becoming very popular as an energy efficient building alternative that you should consider. 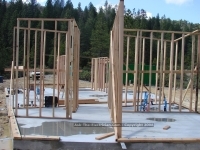 Styrofoam Insulated Panel Homes are an great alternative to standard framing. I have installed the electrical wiring in several SIP Homes and found them to be easier to wire that I first imagined. 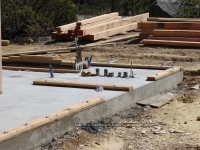 The method is easy to learn once you understand the method of construction. Pre-Planning is a must because of how the panels are constructed and pathways are provided. From an electrician's point of view, wiring a SIP-Home is a little more challenging, however once you understand what you have to work with the wiring goes just fine. The construction process began with a concrete slab foundation which was poured after all the services and utilities installed into a gravel bed including floor heat. The interior walls of this home are standard stick frame construction but with a touch of Japanese design complements of the Tokyo architect.